If you’ve been following along on this blog for awhile, then you probably remember me mentioning mileage goals for past seasons. Every fall, I’d set a new goal to reach by spring—150 miles, 200 miles, 300 miles, and so on. It meant running a lot, because the trails we ran were short. We got a few runs over 10 miles last season, but for the most part, we’d only run four to five miles at a time. When you only have a couple dogs and not a lot of trail to run, you generally run sprint-style (short and fast). That’s the type of races I’ve competed in and that’s the type of training we’ve done up until now. This season, we’re changing it all up. Instead of reaching an overall mileage goal, I’m training the dogs to run longer each time we go out. 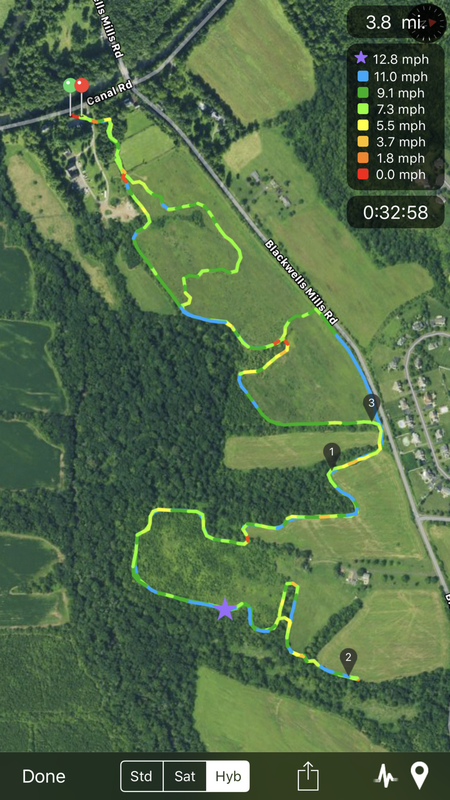 When we move up to Tug Hill, there will be more miles of trail around us, but that doesn’t mean we’ll instantly be running 20+ milers. The dogs need to learn how to pace themselves, or we’ll end up getting stranded. For our past few runs, I’ve held them back at the start so that they maintain a more even pace throughout. I want them to run steady, not as fast as they can. While we still only have short distances to train on, I’m focusing on getting their average running speed up to about 10 miles per hour. Once we hit that, I’ll increase their mileage, bit by bit. I’d love to see them running 25 to 30 miles at a time by the end of this season. The key thing is consistency. It doesn’t matter if they blast onto the trail at 17+ mph if they can’t make it back to the van. The Mushometer maps below show our first run (left or top if you’re on mobile) compared to our run from today (right or bottom). Notice how we went considerably faster at our top speed on the first run (17.2 mph vs. 12.8 mph) but completed a slightly longer distance in less time during today’s run. The lines on these maps should be mostly shades of green and a little bit of blue here and there. Six runs into the season, and I can already see less yellow and orange. If you’re following along on my Patreon, then you know my other goal is to travel by dogsled for a multi-night expedition. I doubt this will become a reality until the 2019-2020 season, as we’ll need this season to train, learn, and grow. I’m also toying with the idea of entering the CanAm 30 in 2020, just to see how a mid-distance race compares to sprint. Until then, there’s work to be done!